der zufolge die Institution der drei sakralen „Könige“ der Toba-Batak eine Parallele in den Pötao der Jarai („König des Feuers, des Wasser und des Windes“) hat. Im Laufe der Untersuchung zeigte sich, dass bei beiden Gesellschaften die Institution der sakralen Führer mit einem bestimmten Muster der Interaktion, die diese Hochlandethnien mit den Gesellschaften des Tieflandes verbindet, zusammenhängt. 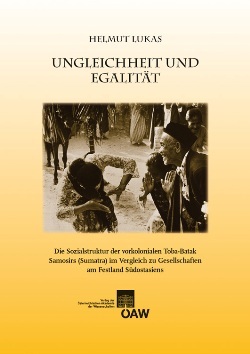 Inequality and Equality in Samosir (Sumatra) – The Social Structure of the Pre-colonial Toba-Batak of Samosir (Sumatra) in Comparison to Societies on Mainland Southeast Asia: This volume attempts at reconstructing the pre-colonial social structures of the Toba-Batak peoples of the Samosir peninsula in North Sumatra. Because production relationships among the Toba-Batak were based on kinship (lineage organization and asymmetrical alliance structures) and in turn, these were the basis for Toba- Batak economic and political organisation, a distinct and independent economic sphere cannot be said to have existed. In part II of the volume, the social structures of the pre-colonial Toba-Batak are compared to those of ethnic groups on the Southeast Asian mainland, especially with the Jarai of Vietnam and Cambodia. The author examines Heine-Geldern’s hypothesis that the three sacred “kings” of the Toba-Batak can considered equivalent to the pötao of the Jarai (“kings of fire, water and the wind”). In the course of the investigation, it became clear that in both societies, the institution of a sacred leader is linked to contacts between these highland groups and those of the lowlands. As are the Toba-Batak “kings”, pötao are worshipped by neighboring tribal groups. In addition, regular ritual trade was conducted between the Jarai and the Khmer in the west, and the Cham and later the Vietnamese in the east.